Last Summer while driving to a family wedding I took a pit stop at a Jacob's ranch in Nebraska. 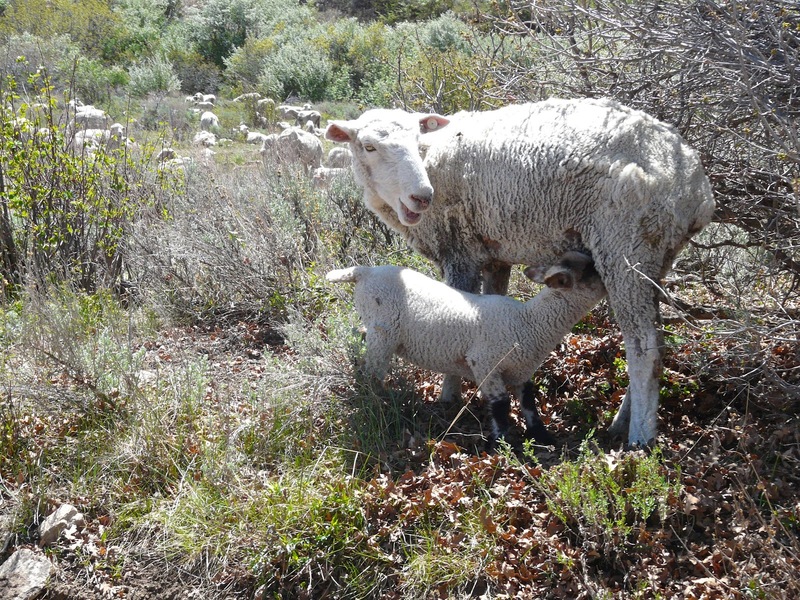 Jacobs are a cute breed of sheep with mixed spots of white and dark brown wool. There most notable feature however is their horns, usually at least four but I have seen them with as many as 7! 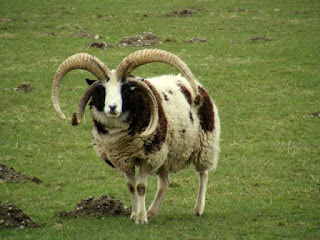 Not all of them grow as impressively as this handsome ram, but there's always something there. 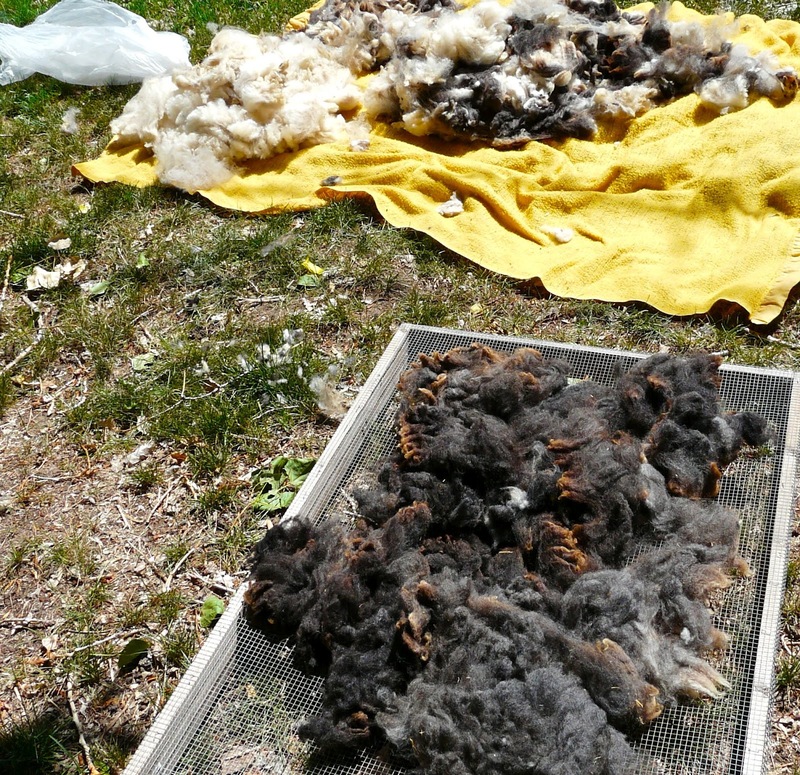 I wanted to enjoy the full range of colors, so I sorted the fleece into three piles. One dark, one white, and the stuff too mixed up to be easily separated. 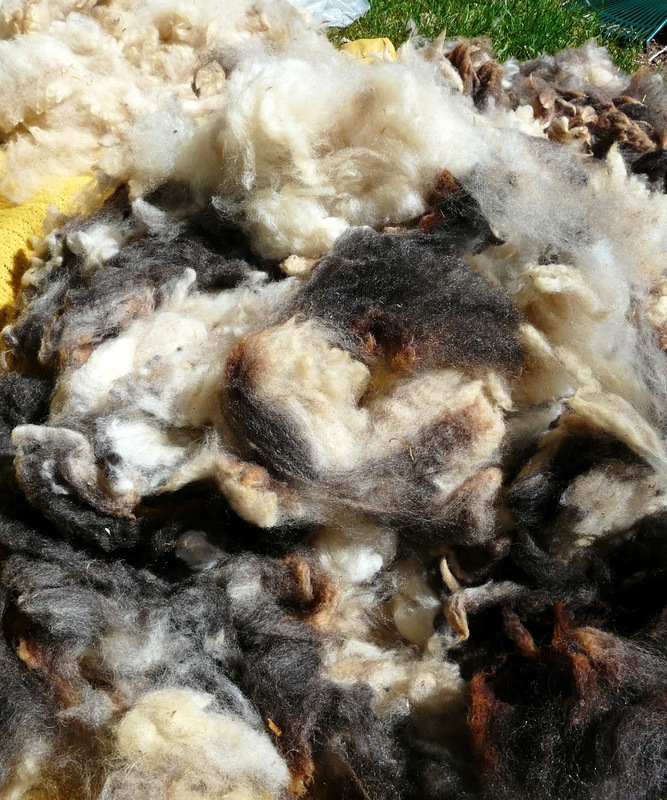 I'm hoping to get a middle shade and do some kind of Scandinavian style colorwork with the finished yarn. The two colors really make a nice heather grey, with just a little brown. 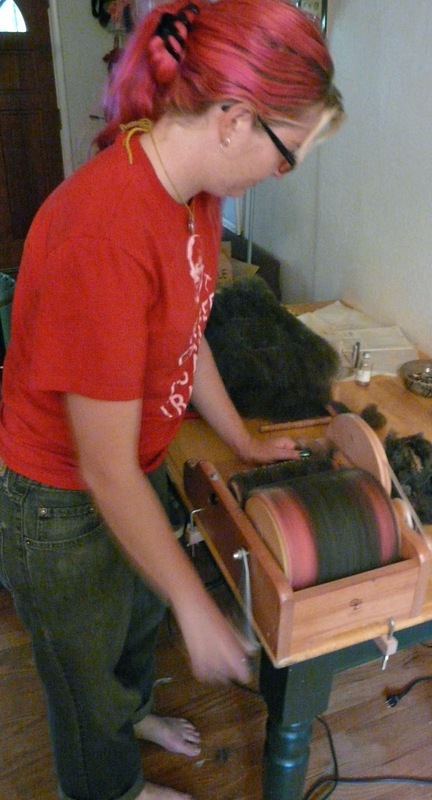 There's an awful lot of grass and hay bits, so it will be slow spinning, but the carding was quick and easy, soft and fluffy! I can't wait to finish the spinning and see how many yards I have, then I'll be able to decide what to make! I've been on a brewing kick. Each time I walk around and see fruits or herbs I think "ooooh, that would be good fermented!" In honor of one of the worlds oldest drinks, here's some fine uses of honey and yeast. 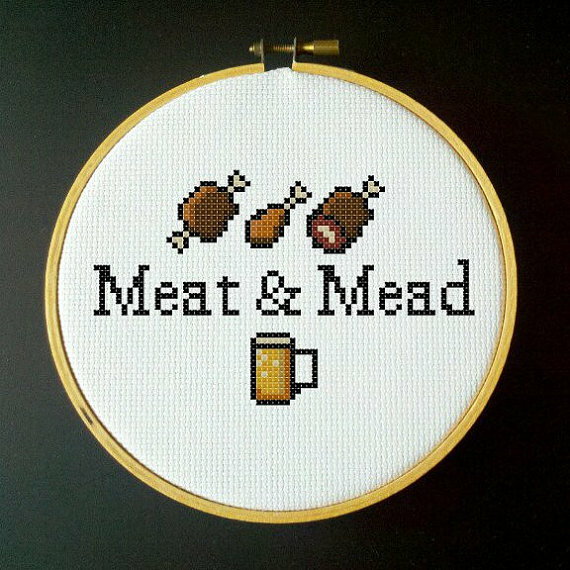 Like a lovely cross-stitch pattern from LadyBeta. Simplicity and deliciousness, the mainstays of the warriors of old! 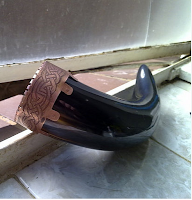 And in the oldest traditions we can fill the horn and pass it around. From a simple cows horn, to exotic species, and horns crusted in silver and gold - what better way to honor the drink of the gods? Decorated horn from FableWorkshop with Celtic knots. Now any fashionable Viking knows about the importance of beard conditioning... right? 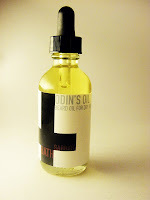 An oil from BathSabbath in perfect scent for Odin's followers. 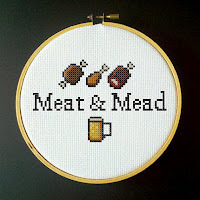 We're used to having our face smell like mead anyway. If you are not so lucky as to posses a large beard (I'm not, can't get the damn thing to grow at all!) 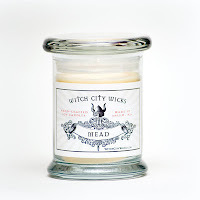 perhaps you can fill your house with the faint sweet scent of drunken revelry. 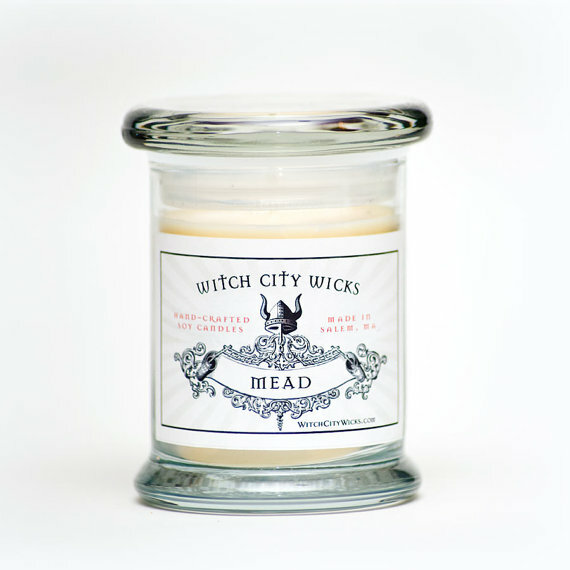 A Mead candle from WitchCityWicks can add ambiance on a whole 'nother level! Light to see your bottles by. 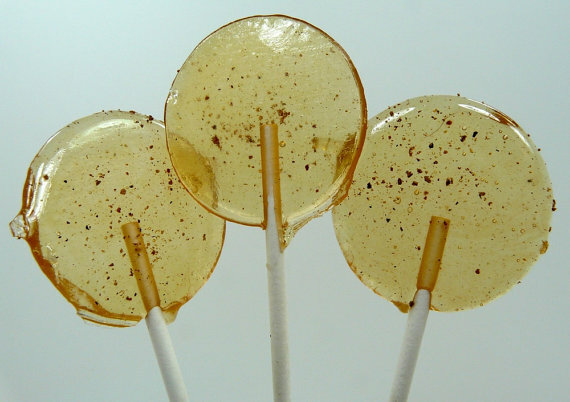 To satisfy a non-alcoholic sweet tooth perhaps some mead flavored lollies? TheGroovyBaker whips up batches for gatherings that need something for the kiddies... or those days when you can't carry the flask with you. 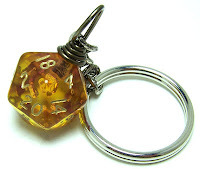 Now I know well enough to never leave the inn without a flask of elvish wine, or a bottle of mead! Any D20 user should beware getting caught without a little spare booze to finish that dungeon, here is "backup mead" from LokisLuckyCharms. 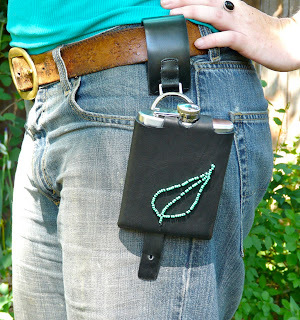 Perhaps not as good as a backup flask, but perhaps one should carry both? Traditional Celtic healing taught that there were three important healing elements. Water, Honey and Labor. I say let the yeast do the work and give them honey and water to work with. It heals me right up... What's your favorite tipple? Have you ever tried brewing? 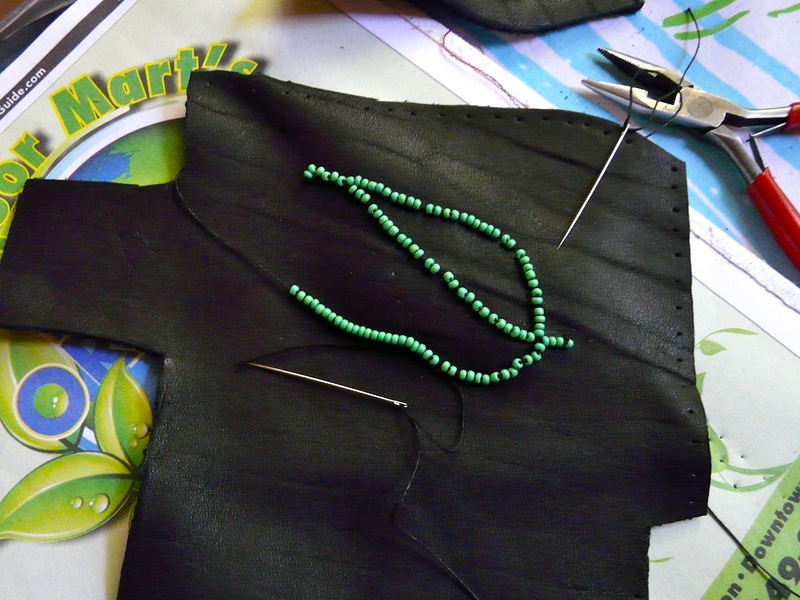 I started a Rhodomel last week. 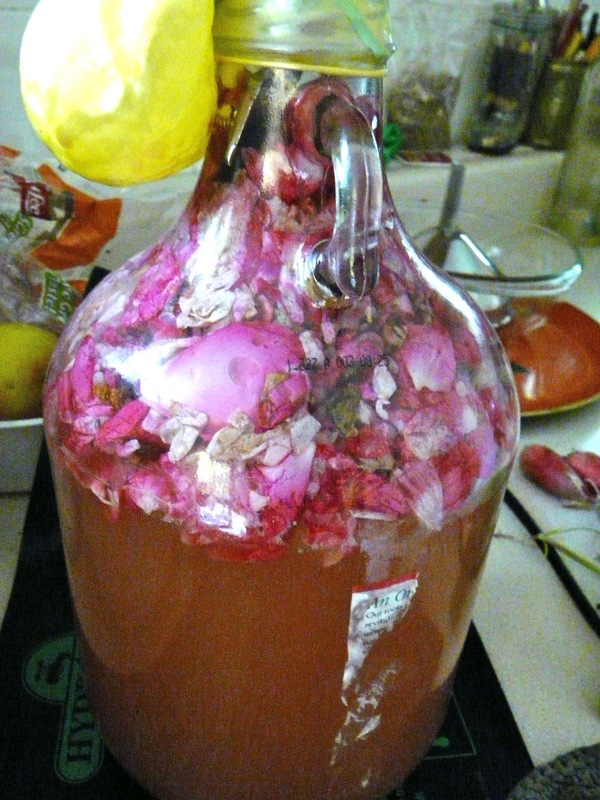 That's rose petals in mead. Roses and honey, awesome! I started with gathering rose petals and drying them for about a week. Then I gathered a bunch of fresh ones as well. 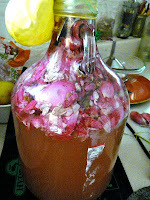 I filled up the secondary fermentation jar with dried and fresh petals all the way to the top. 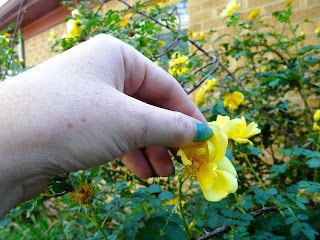 I even had a few petals left over, my mother has a very large summer rose I was gathering from. The recipe suggested 12 cups (which is about how much water was used in the first fermentation) but it's hard to judge volume with a fluffy item. How packed are we talking? After sitting overnight, the mead had turned a nice reddish color. Unfortunately the bubbles tend to lift the petals and force an overflow. It took several days in the sink to get things under control. It's now slowed down and maturing slowly. The balloon on top is my "air lock", it captures gas and can be vented while not allowing bacteria in the air to enter the drink. As for the rest of the petals? An herbal syrup of course! 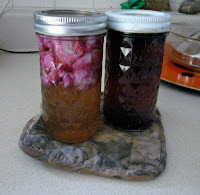 You can make a syrup of just about anything, on this day it was roses and elderberries. 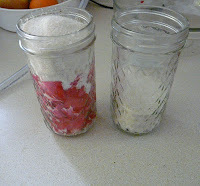 With a light fluffy plant fill the jar, with a dense plant just a few tablespoons on the bottom. 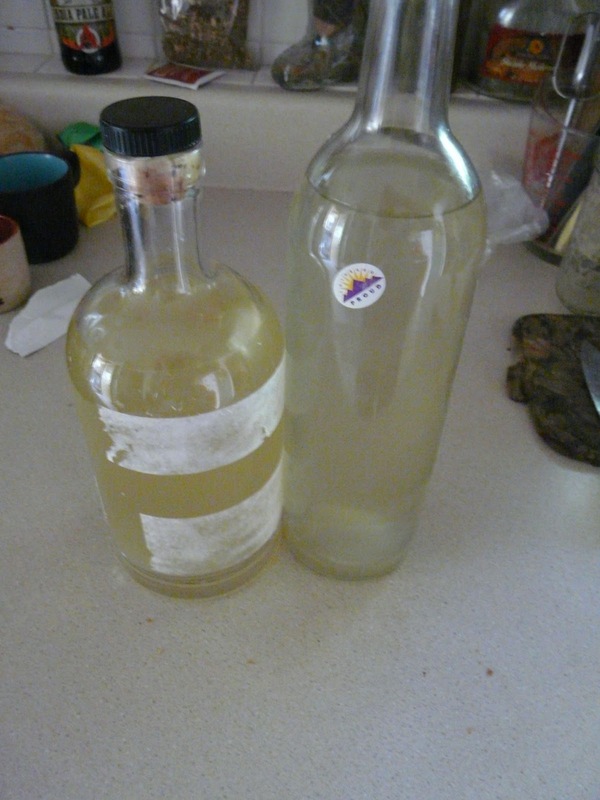 You can use any culinary or medicinal plant for syrups. Add sugar to fill the jar 1/4 -1/3 full. You can use honey with strong flavored herbs like mint or sage, but sugar is better for delicate flavors. Boil water and place the jars on a towel or mat (expanding and contracting glass can crack when dragging across a counter top.) Fill with water and cap. Let the herbs infuse overnight. Afterwards you can keep them sealed in the fridge for months, heck even opened they will keep for weeks. You can use these to flavor teas and drinks. 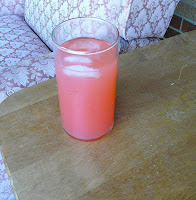 I like to mix one part syrup, one part good local vodka, one part sparkling water and a squeeze of lime. This is surprisingly good with savory herbs like thyme, rosemary, and sage! 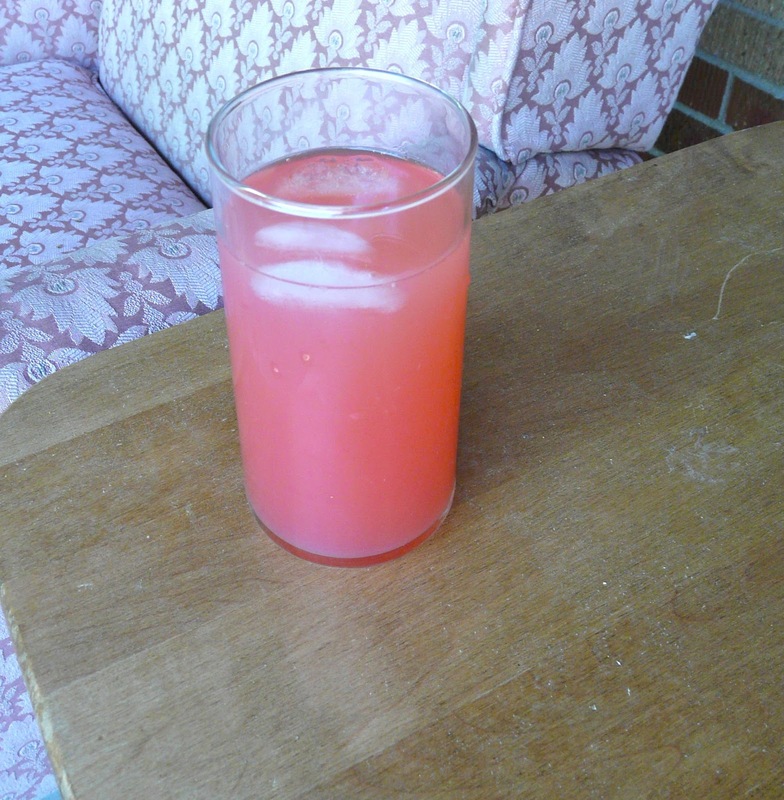 I made the rose syrup into pink lemonade. Lemon juice, syrup, water and ice. A perfect relaxation elixir for a hot summer's day. Bring on the sun, I've got a shady porch and a lounge chair! What's your favorite way to cool off in the heat? After a day of biking and hiking we drove up a narrow and steep road to the flat top mountains. 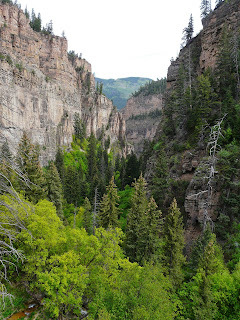 The Canyon is about 6000 ft. at the upper end, our campsite was above 10,000! We woke up to a heavy layer of frost on the ground and ice on the nearby pond, it was a chilly night. But we also woke up to this lovely view! 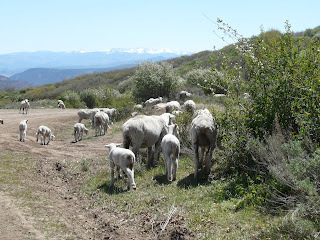 On the way down we came to a switchback filled entirely with sheep and this year's little lambs. Sooooooo cute! It was a noisy dusty scene, but the sheep do know to get out of the road eventually. A little sheepdog even showed up to help keep things moving. 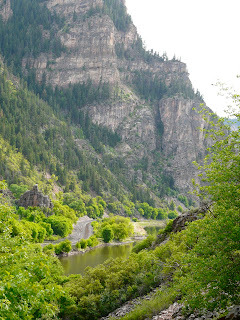 And we spent the next two nights farther down the river, at the mouth of another canyon. Our campsite was nestled right up to the Colorado River, and we got to wake up the next two mornings to a wonderful sight. We could even go fishing right there a few meters from the tent. 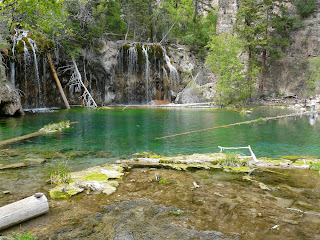 This was a much lower elevation, so we didn't shiver at all those nights. In fact, it was so hot while we were riding we just had to duck into a couple of wineries and a meadery to refresh ourselves. What a bummer... I'm now stocked with delicious local booze for several weeks! What a way to enjoy your state. 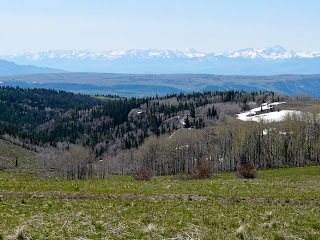 This week I've been away from home - driving, hiking. and riding around my lovely state! 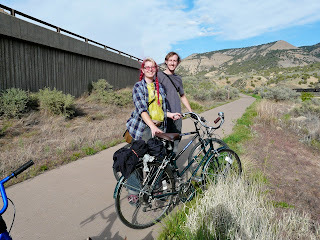 We took a nice ride thru Glenwood canyon to hike the trail to hanging lakes. 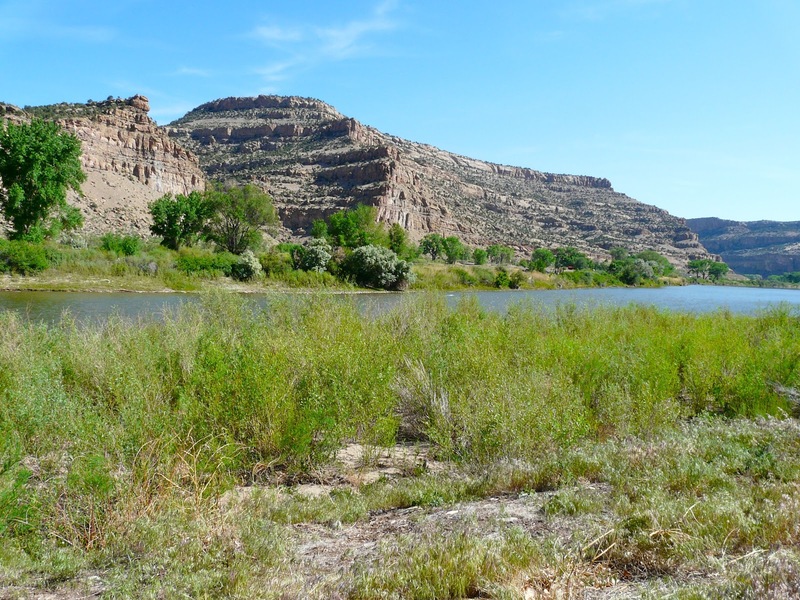 On the east end it is dry open brushland, right next to the river is the only color. It's been a dry year already, and many spots look like late summer instead of spring! 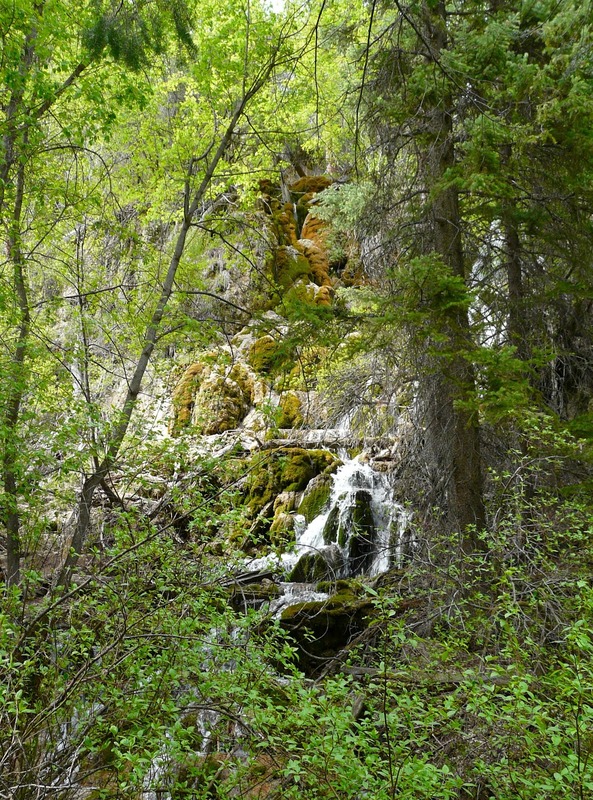 The canyon quickly becomes deep and narrow. 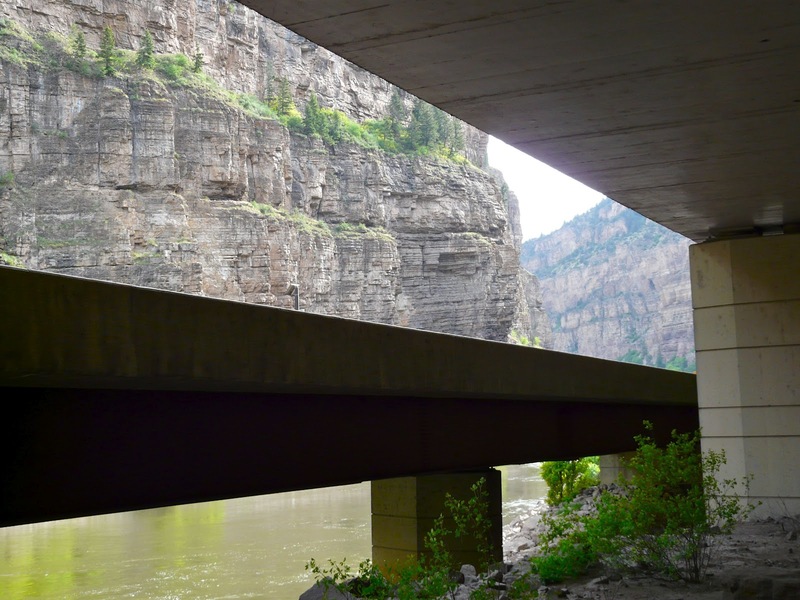 The highway is a bit of an engineering marvel, with the lanes crossing over each other, over the river, thru tunnels long and short, and suspended from the canyon walls. The bike path winds back and forth under the highway in many spots, making for an interesting vista. 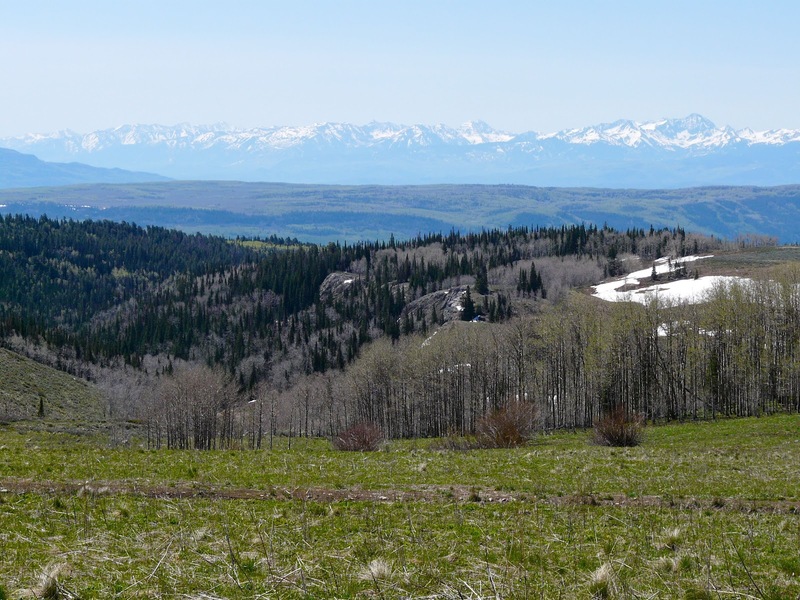 But when you're riding you get to take your time and really enjoy the scenery. 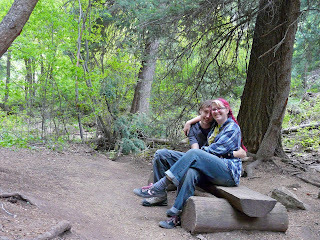 Then we arrived at the trail head. On this part of the canyon the highway has disappeared into a long canyon, and only the bike path and train tracks line the river. 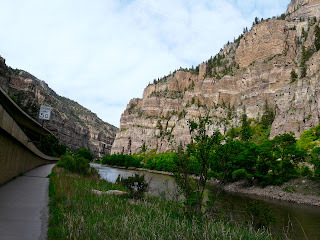 I forgot to mention the train tracks that wind a narrow and precarious path along the canyon walls. It becomes very lush as you walk up the gulch. The trail is very steep and well traveled. 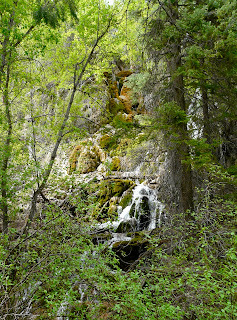 We follow a small creek most of the way, with many little trickles flowing to meet it. I had to wonder about the first poor slops who broke this trail - they didn't even know what's at the top! 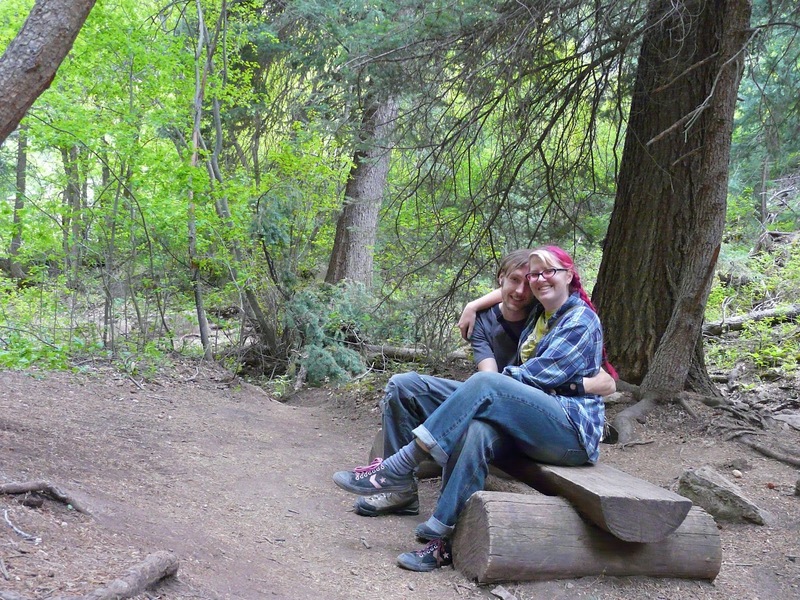 There are plenty of little benches along the trail, so be sure to rest often. 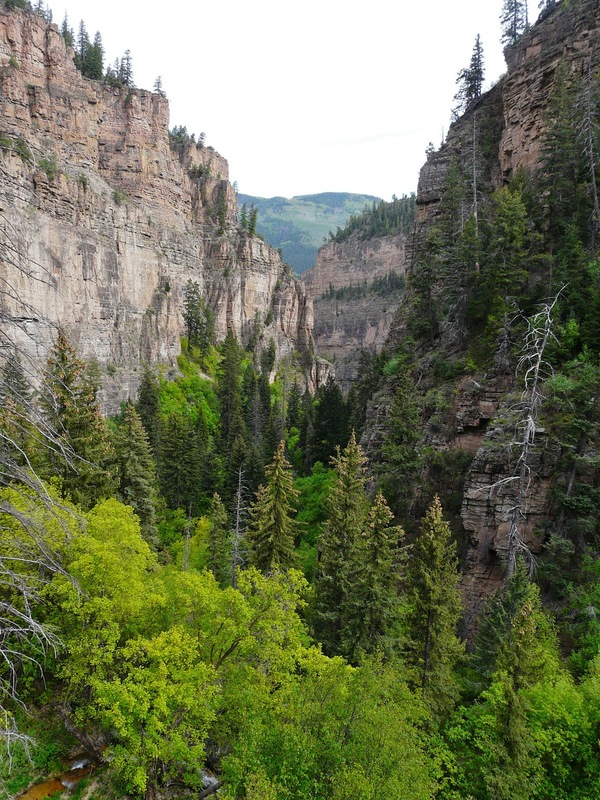 Nearing the top of the gulch one can no longer see the main canyon, and the steep rocky sides dwarf the tall trees. Tada! We've reached the top! 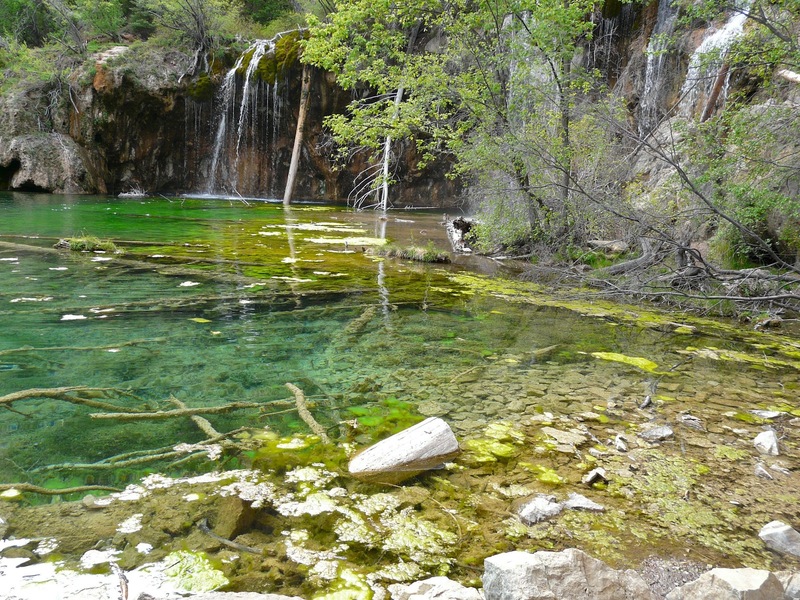 The beautiful lake is kept this color by the dissolved minerals in the water. 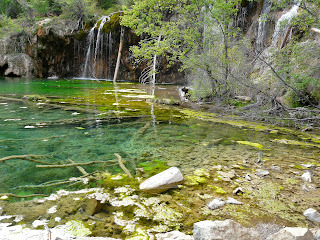 The lake was teeming with little fish and covered in a layer of algae. 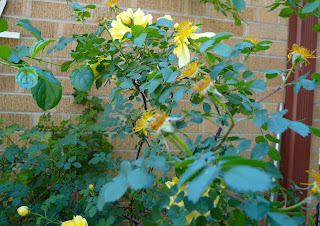 I am lucky enough to have two sprawling summer roses on my property, one yellow and one red. Each one explodes in a shower of blooms this time of year and gives off a heavenly scent into the yard. 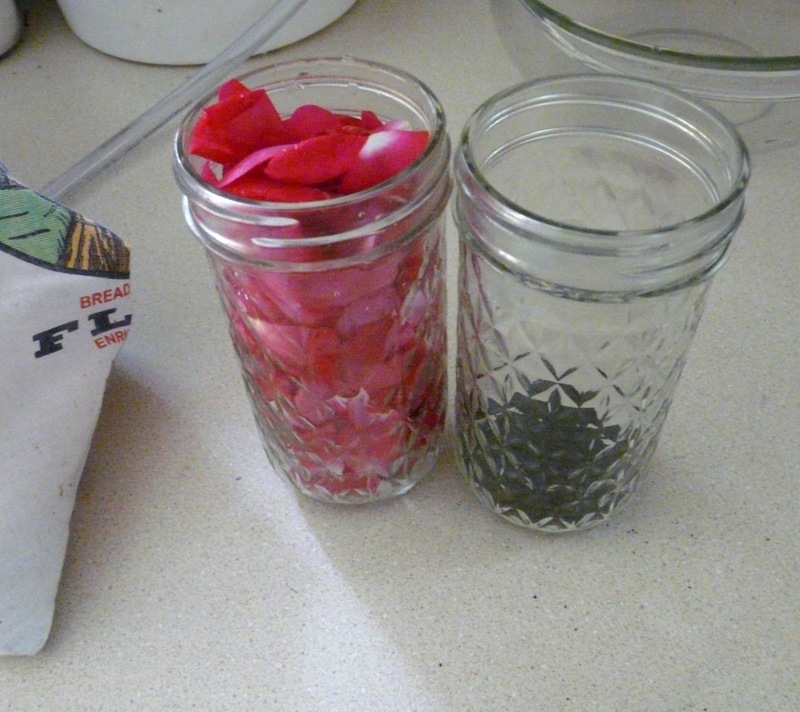 While a lovely flower, one cannot overlook the practical uses of roses as well. In order to get the best harvest, I pick the petals carefully. You see, the fruit of the plants - a rose hip - is every bit as desirable as the flowers, and I want to have my cake and eat it too. I wait until the petals of the flower are starting to wilt and fall off a bit themselves, then I carefully pull them off, leaving behind the stamen and pistil to allow for the fruit to mature. This careful act also lets you shake out any insects that may be hiding in the flowers. 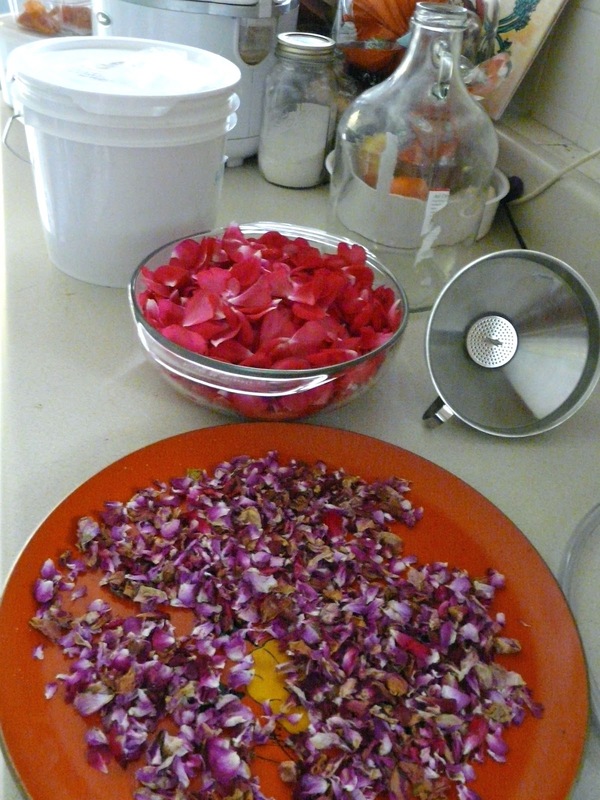 Now the petals have a slight astringency to them and are recommended for stomach ills and ulcers. They are also delicious! I like to throw some into iced teas and herbal concoctions for the yum factor. 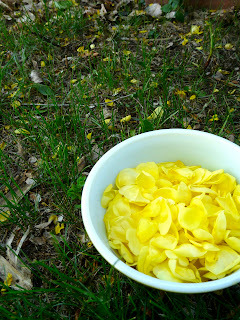 Since they are so light one can easily dry them in the bowl you used for gathering, simply turn and fluff them a few times a day as they sit in a cool dry place. Be sure to stick your nose in the bowl every time you check them, just because you can. While these yellow ones are destined for teas and tinctures, the bright pink bush is being collected for a special project. I just decanted my first two batches of mead into bottles, and I'm starting a batch that will become a rhydomel, Greek style rose mead. After the initial fast ferment I will add as many cups of rose petals as I can muster to (hopefully) make a nice pink boozy sparkling beverage. That's not all! 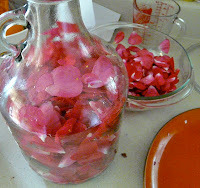 I also like to use pink ones to make a rose syrup, perfect for cocktails and teas, perhaps even lemonade? The hips are a great source of vitamin C and make a perfect addition to immune boosting teas in the fall and winter. Many people even make jams, but I'm not sure my bushes are big enough for that kind of shenanigans. 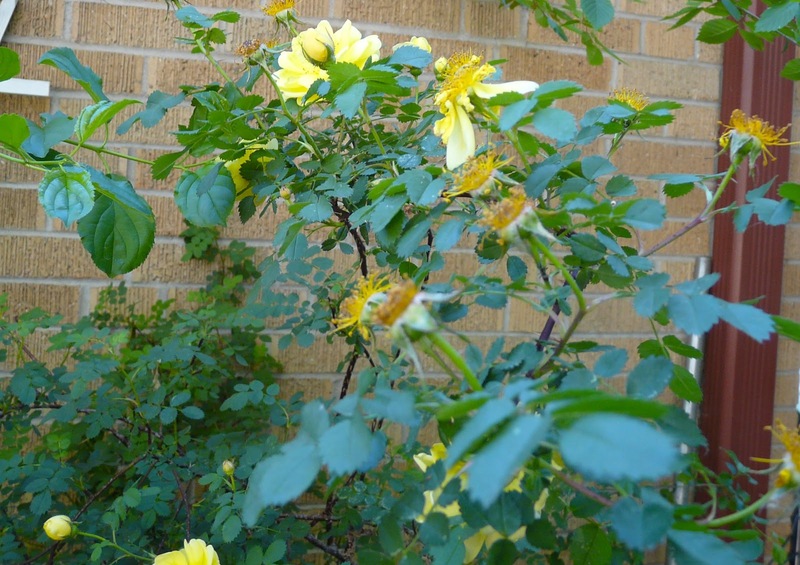 Have you checked your yard for flowers that are edible or medicinal? You may be surprised at what you find! 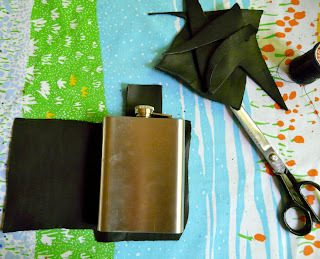 Project of the day today, was to take my plain flask, and make it awesome. Why? Besides the fact I would hate to have a mix-up at an out-door boozing event... Drinking is even more fun with cool drinking vessels. 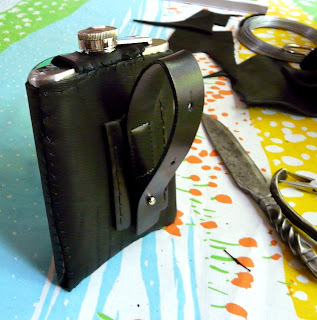 Cut to size, there's a flap for the bottom and a top flap which will be cut to fit over the cap. I punched all the sewing holes with an awl. I can never stand to let things be unadorned so I also punched holes in a leaf pattern to add beads. The beads went on with a two needle technique - one needle strings the beads straight, the other tacks down the cord. It was tough to find a needle that fit the heavy cord and went thru the beads! 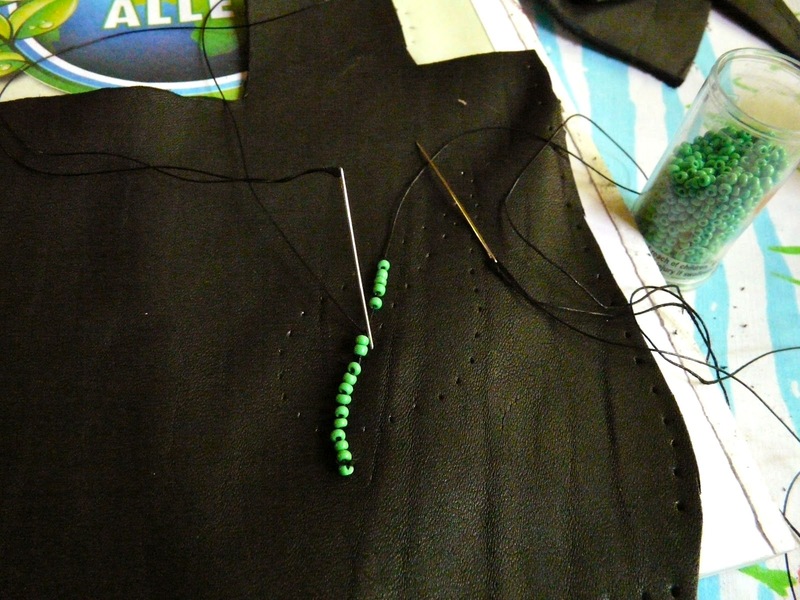 Then stitched up the bottom and side. I cut a hole and sewed the flap over the top, securing the whole case on the flask. 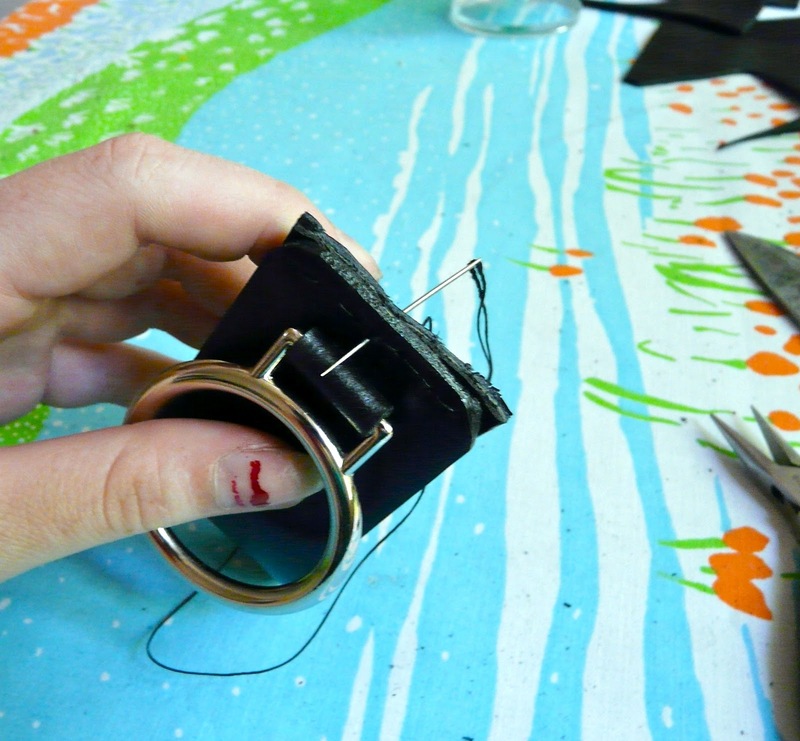 My fingers were getting sore at this point, and I was using a pair of pliers to pull the needle thru. 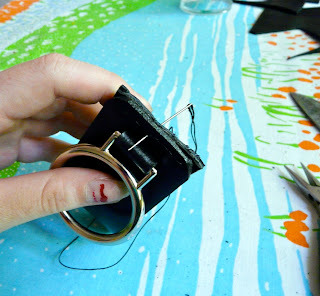 The other end of a scrapped fashion belt became the belt loop piece. simple enough design, but this belt is thick! 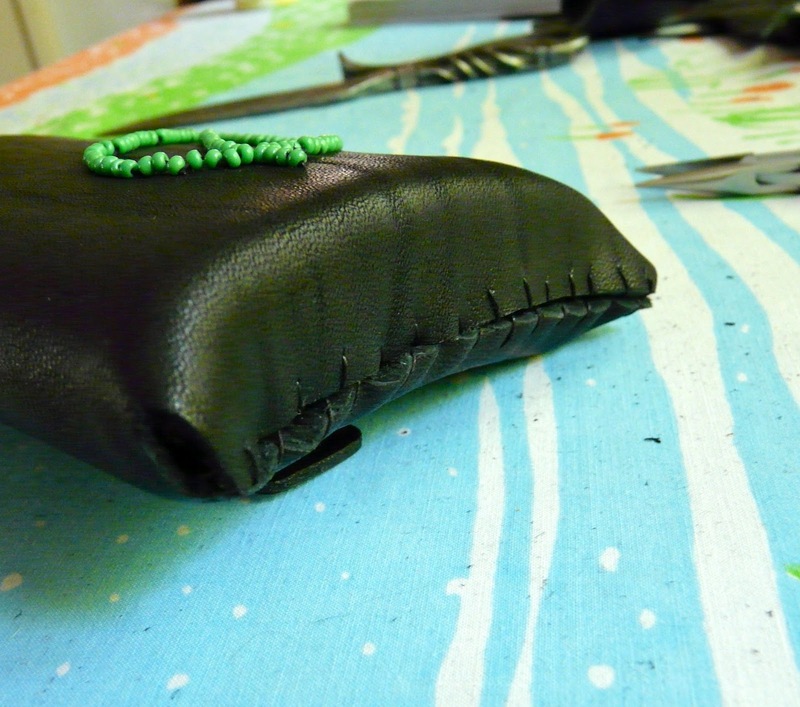 It was tricky, but a short seam. 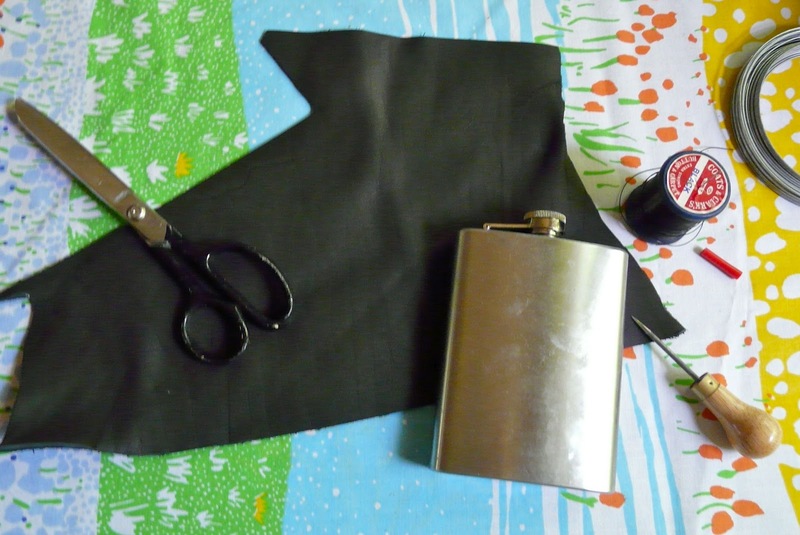 Here we are, a nifty side flask! I can easily pull it off for drinking and refilling. 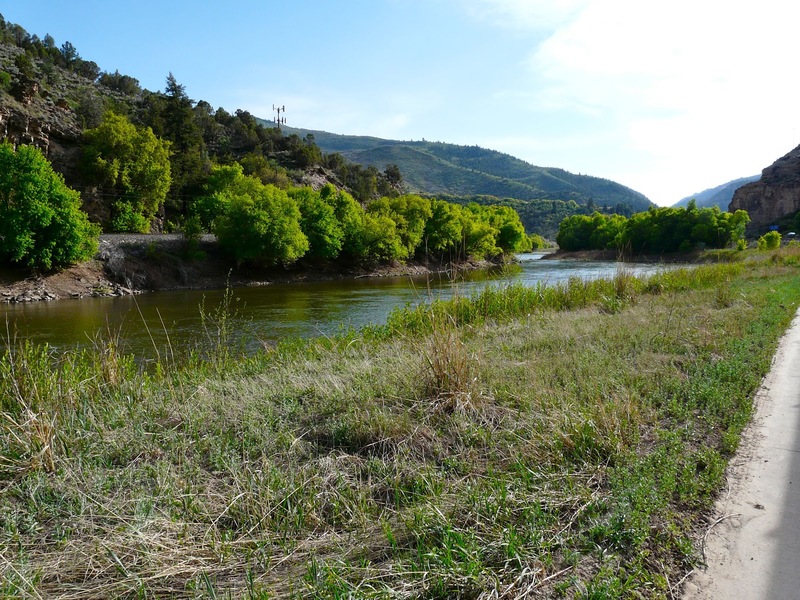 It;s going to be perfect for camping and hiking this summer. 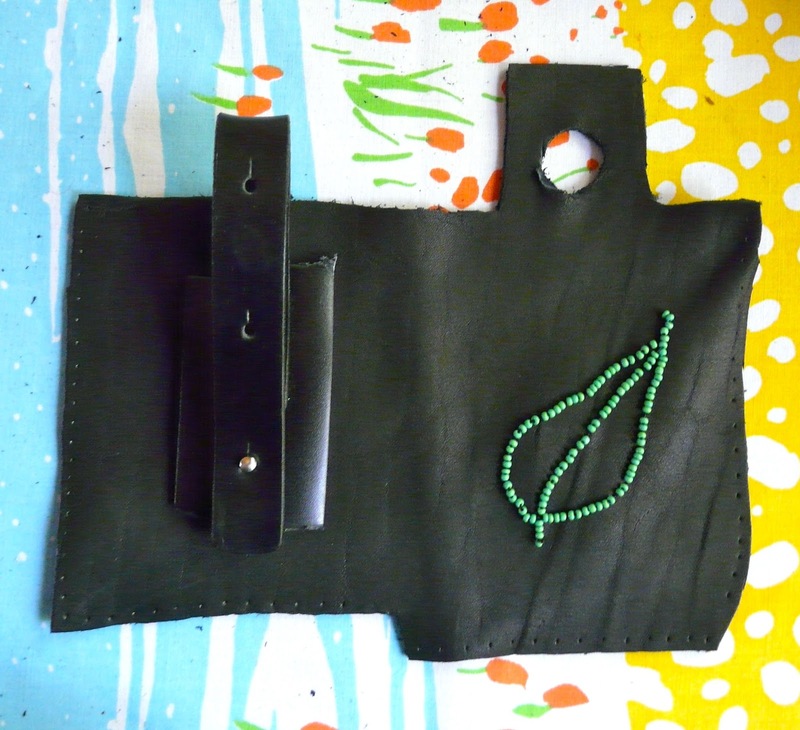 Are you getting ready for outdoors time with your crafts? Happy International Worker's Day! 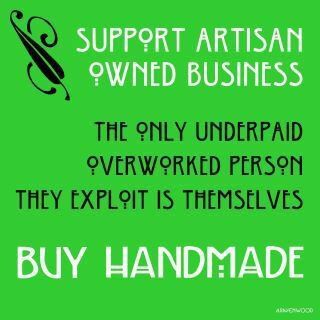 To all the self-employed crafters out there, keep the means of production firmly in your grasp!